older and wisor: Oh, You Cruel Mistress. Craigslist. My best friend. My budgets worst enemy. I didn't have the power to resist this find, especially since it was only 10 minutes away and priced at a song. Roughly. And then it was magic. MAGIC, I tell you. Instant focal point. it was all much better. Especially in the land of blogging. The glorious world where if you can take an "after photo", that means the project is done, right? That's what I thought. Ohhhh I love it!! I loved it all shabby chic like. But of course I love your style too and your constantly impress me. We're hoping to get a camera today so I can start on MY very own, "I like 'em big, I like 'em chunky" post. Craigslist is the bane of my existence too...at least I sell a lot of crap there too to support my habit. Love the mantle, too. Makes the room look finished. Where'd you get your clock? That is an AWESOME find! WOW! I love the mantel. I'm on my way to check out craigs list NOW! I am sooooo jealous! I've been looking for the same thing on Craig's List forever. Literally, since the beginning of time. Ok, so close to that. It makes such a difference! Yay for you (me? still extremely jealous). You did such a beautiful job with this! What a great find! I love that your "kids corner" is this dreamy-gorgeous decor mag pic of a room. I will definitely NOT be telling you what mine looks like, but let's just say it's waaay better than yours. 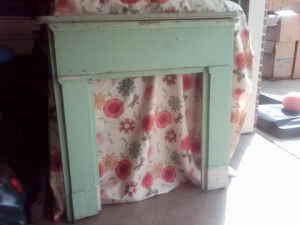 Who finds an old mantel on Craigslist, btw? Who!? You're children will never be able to live in a house with WHITE WALLS... it just wouldn't feel like "interesting, charming,and always a magical...HOME! Oh for heaven's sake Rebecca. You DO have a Craigslist problem if you are searching in states you don't even live in. Don't you have a JOB now? But yes...touche. You have shut me up. We have mantels for sale in Utah. I stand corrected. Unfortunately, my decorating emergency mantel fund has recently been raided for some decorating emergency bookshelves that just couldn't wait. This looks really good. What a creative eye you have and what a find! Something to think about...you could staple or tape some black matboard to the back over the opening to cover the beadboard. That might make it even more realistic. we have a fake fireplace in our family room which is GORGEOUS but same flat wall. I found a huge needlepoint thing, framed it and put it in the hole that we painted black. Everyone thinks its real. your room is Gorgeous too!